Full shares will also have tomatoes and leeks. It was Kitanas last day last Thursday, and the chickens seem sad and are looking for someone to cuddle them. We had also been talking about whether Butters (the dog who showed up for 2 weeks and then disappeared for the summer) would come say goodbye. Just after discussing this, we went to get into the truck, and to our surprise, the dog was sitting in the truck! I have no idea how he even got in there. 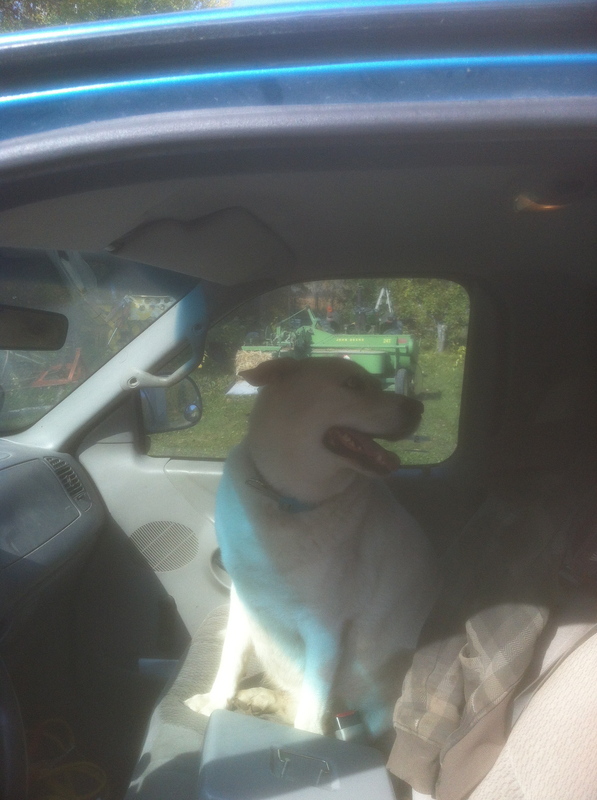 Later that day we also found him in Nicole’s car and then later on he was on the tractor. It’s nice to know the dog hasn’t forgotten us. Over the weekend I also learned a very natural way to deal with voles. Meadow voles are a huge pest on the farm. They eat 2x their weight a day in vegetables, and reproduce so fast that 2 can turn into 1200 within a year (I forget the actual statistics, so I’m problem wrong). I have trouble bringing myself to stomp on the voles- which is what you’re supposed to do- but if I pull back the foliage the chickens scoop them up instantly. What ensues looks like a game of chicken football, as the chicken with the mouse goes running and every other chicken in the field starts chasing it. 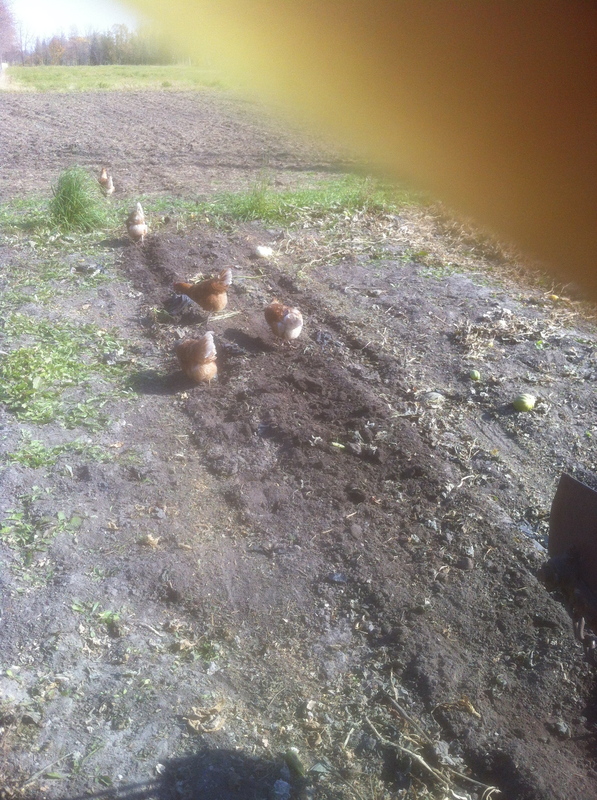 The farthest chicken in this picture seems to have got a touch down. I saw the chickens eat 10 mice just out of the squash patch this weekend. Other than that, things are winding down a bit. I’ve been tilling in the finished crops and planting rye and the fields are starting to look bare. We plan to plant garlic this weekend (for real this time), and everyone is welcome to come out and join us. There will be a bread vendor both Tuesdays and Thursdays selling whole wheat bread and Challah. The fish people have finished for the year, and a lot of craftspeople have finished for the year due to the cold weather and lack of daylight. 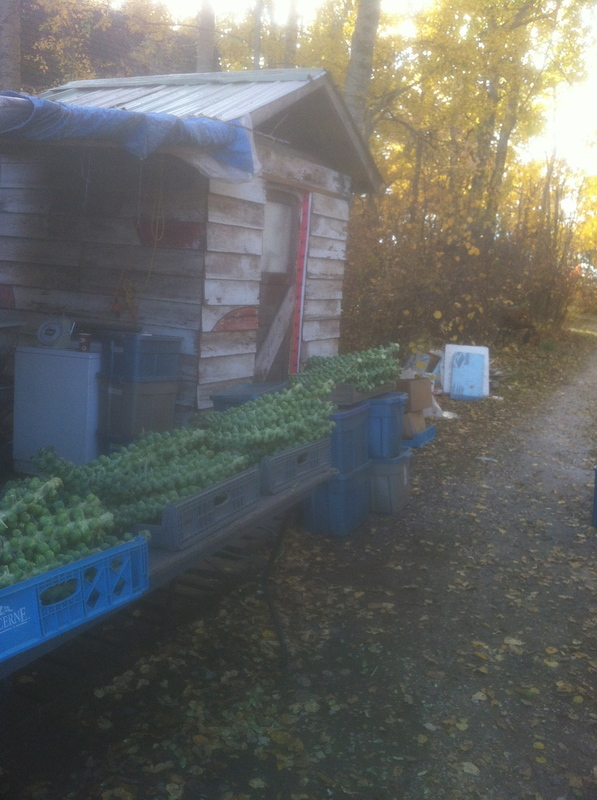 The hours for the market for Oct are from 4-7. There will still be Jonnies Sticky Buns, and a couple other vendors including veggies and pumpkins right to the end of October. I did not know that chickens are carnivores! Great pictures and I love the dog in the truck. Yes, I was a bit worried at first when they took over the garden that they would be pecking at the greens, but the only things they seem interested in are insects, worms, mice and the compost pile. Living vegetables they apparently do not like to eat. Old corn and rotten watermelons seem to be their favorites.